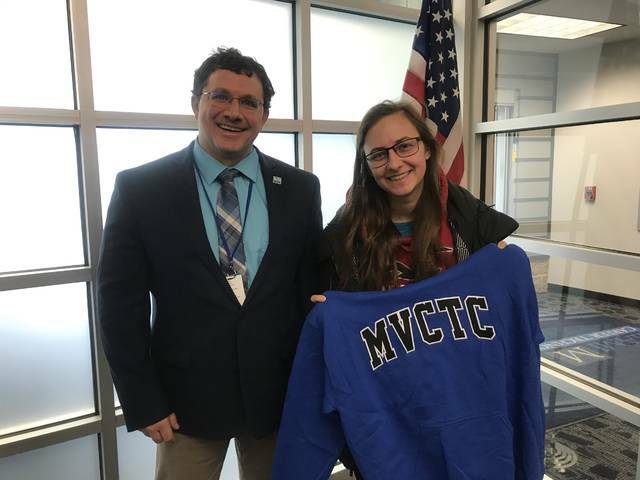 Pictured, Morgan Brooks (Criminal Justice senior student from Eaton) was awarded the February 2019 MVCTC Integrity Award. Brooks was presented her award by South Building Principal Craig Vasil. ENGLEWOOD — During the 2018-2019 school year, Miami Valley Career Technology Center (MVCTC) will introduce a new student recognition program to encourage the Choose Kindness Campaign started in April of 2018. The new MVCTC Integrity Award consists of “Caught Being Kind” cards that are awarded to students who are observed demonstrating kindness to other students. The “Caught Being Kind” cards are issued by any MVCTC staff member who observes a random act of kindness and wishes to acknowledge and recognize the student for their kindness/character. Students receiving a “Caught Being Kind” card put their name on one half of the card and deposit it in the Integrity Award box in each building’s front office. The other half of the card should be kept by the student to take home to share with family. Each month a drawing is held awarding one lucky “Caught Being Kind” recipient with the MVCTC Integrity Award for each building. The winners receive an MVCTC hooded sweatshirt, are recognized as a monthly Integrity Award winner on social media, the MVCTC website, and a special bulletin board in each building. The goal is to support and reinforce a culture of kindness by recognizing and rewarding random acts of kindness by MVCTC students. https://www.registerherald.com/wp-content/uploads/sites/41/2019/03/web1_February-South-Morgan-Books-1-.jpgPictured, Morgan Brooks (Criminal Justice senior student from Eaton) was awarded the February 2019 MVCTC Integrity Award. Brooks was presented her award by South Building Principal Craig Vasil.